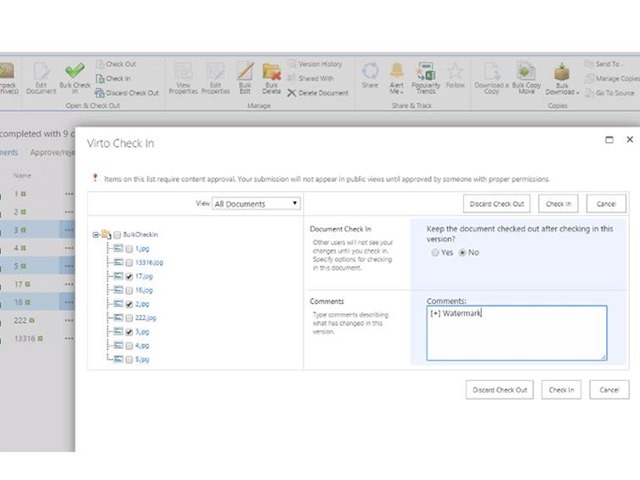 Recently, we took a look at Virto’s SharePoint 2013 workflow activities kit and we were happy with what we saw. 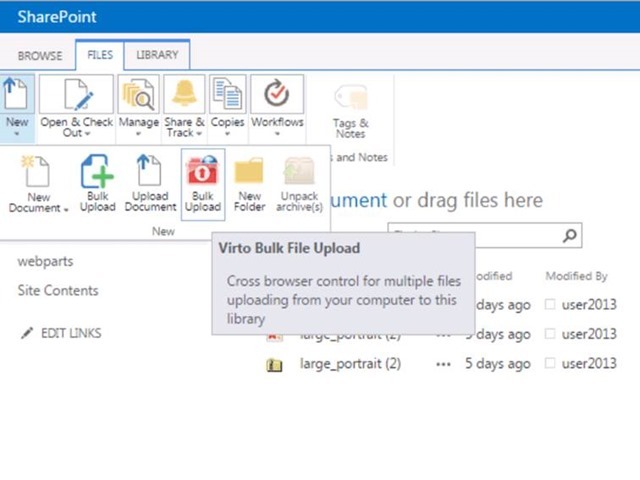 As a result, we also decided to take a lok at another Virto product, the Virto Bulk Operations Toolkit. This is a bundle of 8 components that all do something useful with bulk operations and is shipped with a nice bulk bundle price saving you over 40%. This is a feature-packed bundle that is definitely capable to handle some of the questions we or our customers have been struggling with. And, oh yeah, it comes with comprehensive and extensive documentation. Let’s take a look at the 8 components. Search support for check in and approve actions. CAML query support for check in and approve actions. Menus that are aware of current user permissions. Ability to check-in documents in folders and subfolders. Bulk check-in and approve capabilities. This is a component for SharePoint multiple files editing. This is a request we’ve heard time and time again (although you have to be careful with this! 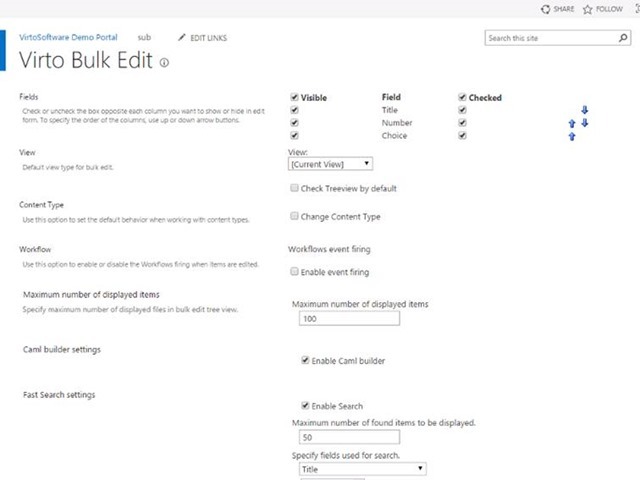 ): the possibility to do SharePoint bulk edit. In other words, to edit the same metadata field for a bulk of list items. 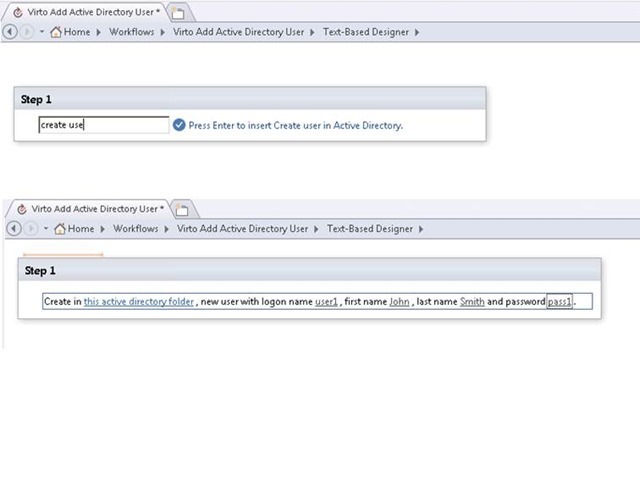 This enables end users to specify metadata for a bulk of items in 1 go (supported in all types of lists and libraries)! The ootb datasheet view alleviates the problem somewhat, but it is nowhere near as easy to use as this component. See the following screenshot to get an impression. Ability to create new terms. Search support for edit scenarios. CAML query support for edit scenarios. Bulk edit for list or site scopes. Editing data of the same field for a group of list items. 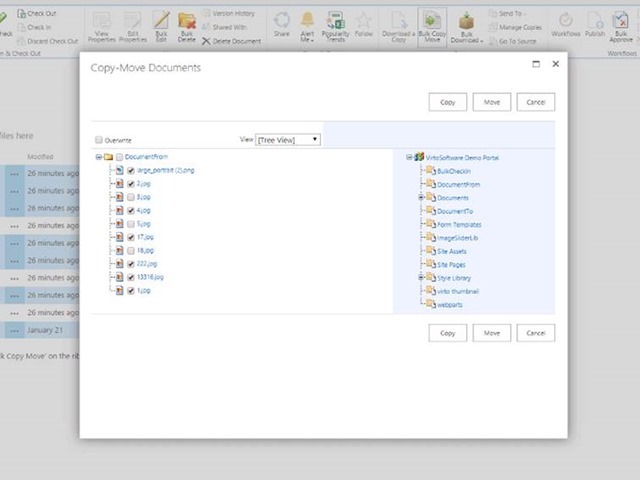 This is a component for SharePoint multiple file copy and move. The copying (or more often: moving) of large amounts of list items and/or documents is usually something that end users request of administrators, who usually use a high-end migration tool to do the heavy lifting. This component is great in that it places the power of moving larger amounts of misplaced documents/list items in the hands of end users in the form of a separate web part or an additional action in the Action menu. Also check out the Figure below. Support for search for copy & move operations. Support for CAML queries for copy & move operations. Filtering possibilities for copy & move operations. Support for using the same SharePoint views as in source libraries. Search support when deleting files. CAML support when deleting files. Flexible max amount of files that are displayed. Filtering possibilities during file deletion. Choosing specific files for downloading. Download a bulk of files in a single archive. 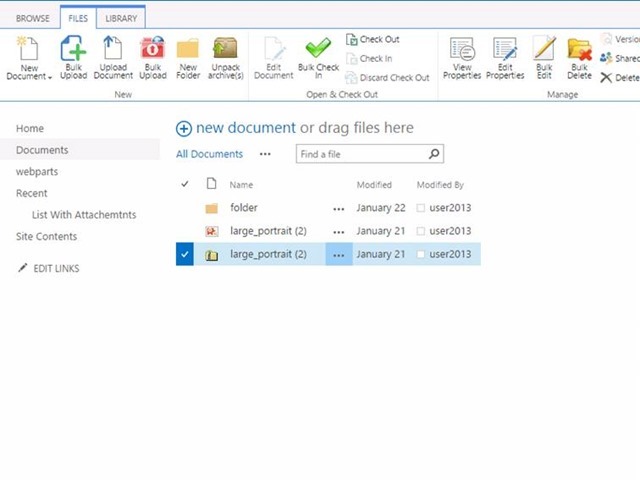 This is a component for SharePoint multiple files unzipping. This component unpacks zip archives to document libraries, retaining the original structure. 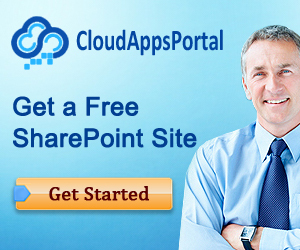 For end users migrating to SharePoint from another system, this can be extremely useful. 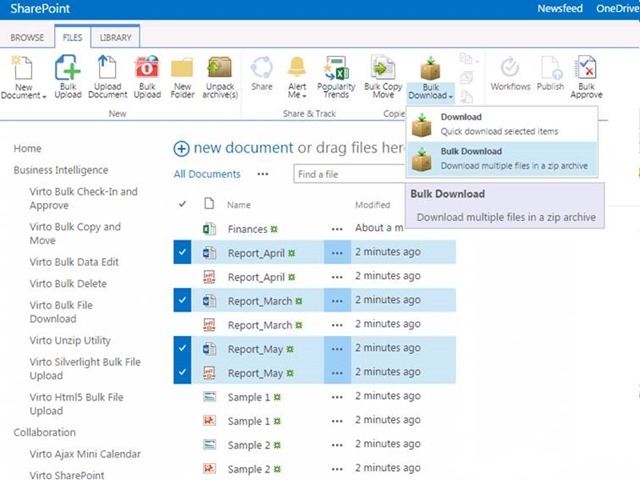 This allows end users to pack their documents, stuff them in SharePoint, and then use the Bulk File Copy and Move and Bulk Data Edit Web Parts to get the documents organized! This is a nice example how the separate components within the bundle seem to enhance each other. The next Figure shows how easy it is: select an archive and click the Unpack button! Unpacking archives to SharePoint document libraries. Preserving folder structures after unpacking. Ability to retain original file creation/modification datetime! This is a really cool feature which can be very important in certain legal situations. Auto-deletion of archives aftyer unpacking. Unzip settings are scoped at either the library or site level. 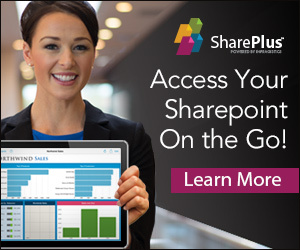 The standard SharePoint tools for uploading files in bulks to SharePoint are not advanced and reliable enough. There are community tools that are better, but offer very limited support which is commonly not acceptable in enterprise scenarios. There are high-end migration tools that do a great job at a great cost. Possibility to add field descriptions. The possibility to redirect all requests to the standard upload page to the Virto Bulk Upload (via an HTTP module). Possibility to resize jpeg images during upload. Partial uploading of operation is cancelled. It seems that Virto fills a very nice niche here by offering a professional and supported solution at a very reasonable price (at least, that’s what we think). The next Figure shows an impression. 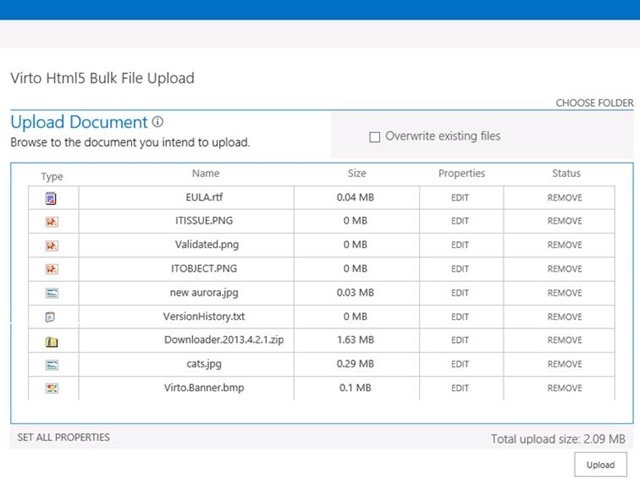 Last but not least, this is a component for SharePoint multiple files upload. This component is a nice enhancement to the Bulk File Upload Web Part and is completely written in HTML 5. It is very similar to the Bulk File Upload Web Part except that it’s even better! This component is probably our favorite in the bundle. The next Figure shows what it looks like. Support for uploading files via drag-n-drop leveraging just HTML 5. Ability to overwrite files during upload. Restriction of file types that can be selected. Limiting the max file upload size. Support for unlimited amounts of content types and fields. And, as all of Virto’s components, cross browser support for MSIE, FireFox, Chrome and Opera. 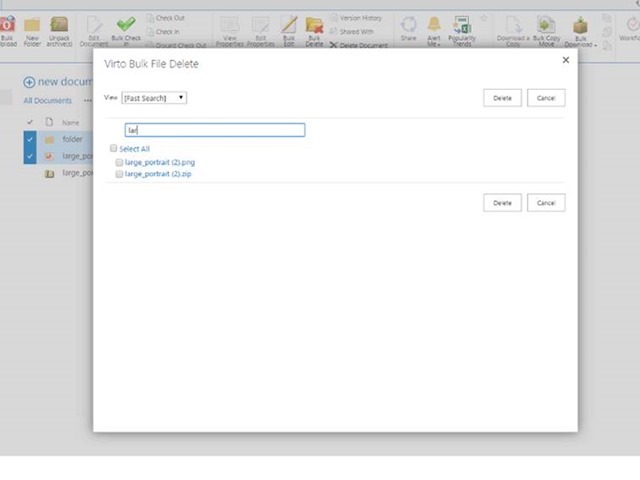 So if any of the features of the Virto Bulk Operations toolkit appeal to you, we won’t try to stop you checking it out at http://www.virtosoftware.com/bundles/virto-bulk-operations-toolkit.